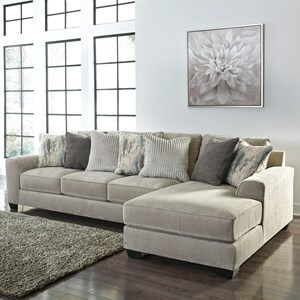 Sophisticated contemporary style with comfort made for lounging, you will love the updated look this three-piece sectional with a chaise adds to your home. 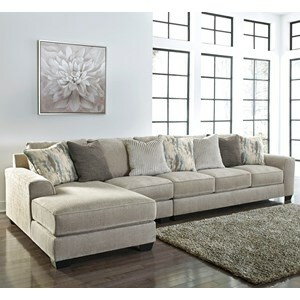 Gray-tone soft chenille microfiber covers the body of the sectional. 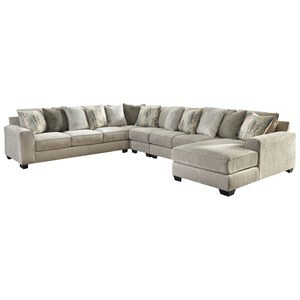 Plush back cushions and loose T-style seat cushions provide cozy seating. 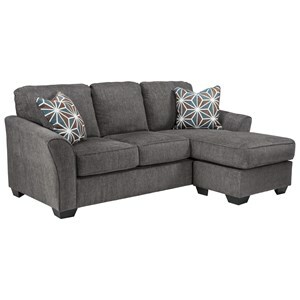 Low tapered feet, set-back flared arms, welt trim, and fun geometric print accent pillows complete this sectional's sleek design. 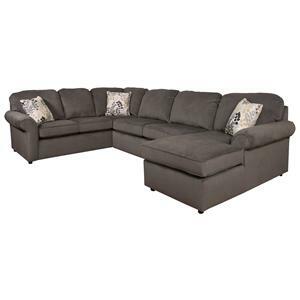 The Loric - Smoke Contemporary 3-Piece Sectional with Left Chaise by Ashley Furniture at Gill Brothers Furniture in the Muncie, Anderson, Marion, IN area. Product availability may vary. Contact us for the most current availability on this product. 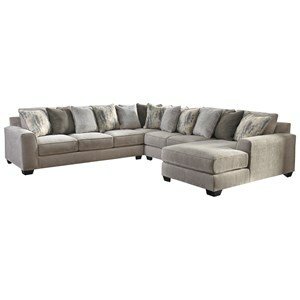 1270034 Armless Loveseat 1 62" 39" 38"
1270016 LAF Corner Chaise 1 36" 62" 38"
1270067 RAF Sofa 1 88" 39" 38"
Pillow 3 Square Accent Pillows with Geometric Fabric on One Side: 41% polyester, 59% acrylic. Other Side Matches Body Fabric. Frame Construction Frame constructions have been tested with various equipment to simulate the home and transportation environments to insure durability. Corners are glued, blocked and stapled. Seats and back spring rails are cut from 7/8” hardwood. 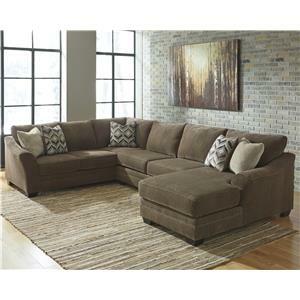 Comfortable as well as stylish, the Loric upholstery collection sets the tone for a contemporary living room. 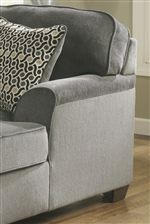 Soft chenille microfiber in a smoke gray complements plush back cushions and T-style seat cushions with welt trim. Flared arms and print accent pillows pull together the entire look. The Loric - Smoke collection is a great option if you are looking for Contemporary furniture in the Muncie, Anderson, Marion, IN area. 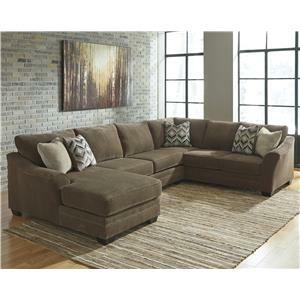 Browse other items in the Loric - Smoke collection from Gill Brothers Furniture in the Muncie, Anderson, Marion, IN area.